Quiet stay with family, friends, lovers. 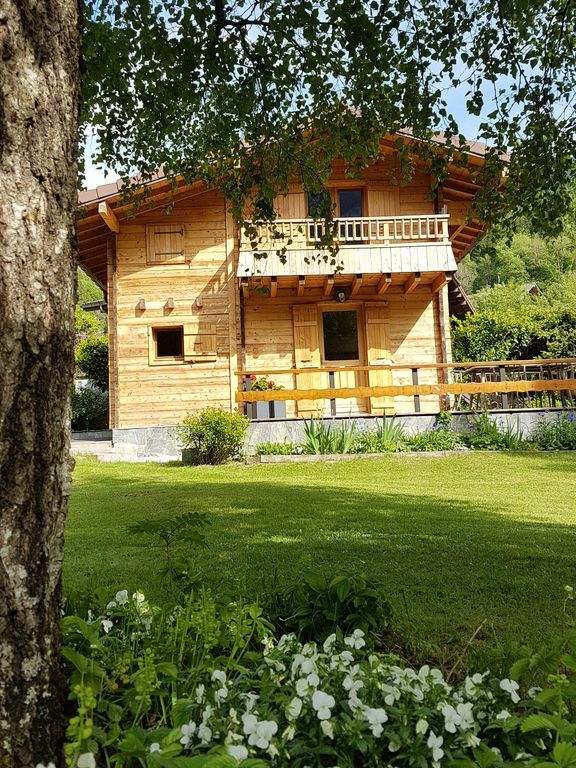 At the door of Aravis, near the ski resorts of La Clusaz Grand-Bornand 15 minutes from Lake Annecy, discover Les Bédières the last Des Chalets d'Emile to be renovated in a mountain spirit, quiet, on a vast ground sported. This chalet with its bedrooms upstairs will seduce you with its cozy and comfortable atmosphere. (capacity 5 people, possibility 6 people). Its location will allow you to practice all sports, you can admire wonderful landscapes both winter and summer, to discover the mountains, lake, crafts and local gastronomy. The valley of Thônes is the cradle of Reblochon and buckshot. a bathroom with a walk-in shower, a sink, a towel radiator, a hair dryer. Terrace, large garden, private parking. Deposit: 500 € requested on arrival. Returned no later than 14 days after the stay. We had a fabulous week here. Standard of accommodation was excellent - spotlessly clean and well kitted our. Lots of proper sized glasses, proper tv (we brought an amazon fire stick) and good WiFi. Only 1 thing - an extra comfortable chair would be good. There’s only comfy seating for 3 and after a day’s skiing you don’t want to be sitting on a hard chair! The traffic from La Clusaz after 5 was awful but it was half term week..... we would highly recommend staying here. The chalet is an excellent base from which to explore the mountains and Lac Annecy, with a couple of good supermarkets nearby (intermarché was better on the road up to Villard-Sur-Thônes), and some good boulangerie in Thônes. The chalet itself is small but nicely laid out. It’s very well equipped (the knives are sharp!) The twin bedroom got a bit stuffy but it does have two windows with bars across so you can keep them open. The beds are exceptionally comfortable with lovely bedding. I slept very well there. It has a modern TV and good Wi-Fi which meant I could cast Netflix to it without a problem. Also meant we could listen to Spotify through the TV. Nespresso machine was a very welcome touch. The shower is excellent. There’s a small barbecue to use too. The garden is big enough for a water fight (summer vacation obviously). Another comfortable chair in the lounge would be welcome as the sofa seats 2.5 people. A word of caution, the chalet was clean to a very high standard when we arrived and unless you are confident about being able to return it to that standard when you leave, it would be better to pay the cleaning fee. This will save an awkward conversation at the point of leaving when Madam declares that your cleaning is not up to her standard. Highly recommended place to stay though. We hope to go back as there is lots to do that we didn’t have time for. Lovely cottage with beautiful mountain views. Nicely decorated with good shower. Shame there was only comfy seating for 3. Fantastic chalet in great location. We spent a wonderful week in this gorgeous modern chalet, which is just as lovely as the photos suggest. It was spotlessly clean, well equipped and very tastefully presented. Set in a private and secluded garden, the chalet has wonderful views and we stayed in most evenings to enjoy them while relaxing on the veranda after days filled with hiking, swimming and biking. Veronique, the friendly owner, helpfully told us the best places to swim in Lake Annecy – which is only 25 minutes away by car – and where to hire a boat by the hour. We’ll never forget our stay in the French Alps in this delightful holiday home. Gîte très agréable, au calme, joliment décoré, propre et très bien équipé, propriétaire sympa et de bon conseil pour les visites. Il est aussi très bien situé pour découvrir la région. A réserver sans hésitation !